Grease an 18cm deep cake tin with the coconut oil. With a food processor, crush the pecans and almonds with the dates and salt until the nuts are in very small pieces and the dates make the mixture gooey. Use your hands to check the stickiness of the mix. It should all bind together well. If not, then use a few extra dates and pulse the mix again. Press the crust into the bottom of the tin. Soak the cashews overnight or for a minimum of 4-6 hours. Drain and rinse. Add them to a food processor with the maple syrup, vanilla powder and lemon juice. Mix well for about 3 minutes until the mixture is really smooth and creamy. Add the coconut oil and mix again. Separate the mixture into three equal portions. Add the frozen strawberries to a third of the mixture and blend again. Spoon this mixture on top of the base in the cake tin, then place the thinly sliced strawberry pieces on top. Place in the freezer for 30 minutes to 1 hour, if you have time, in order to firm it up before adding the second layer. Once it has firmed up a little, put the second third of the mixture on top of this – the vanilla layer. Return to the freezer again for 30 minutes to 1 hour. Return the remaining third of the mixure to the food processor and add the blueberries and coconut, mixing well. Spoon this layer on top of the vanilla layer. Leave the cheesecake to set in the freezer for 2-3 hours, taking out at least 30 minutes before serving. Serve with fresh berries and coconut flakes, if using. Best stored in the fridge. Visit Olivia’s site for more low-sugar inspiration. If you've got a sweet tooth but you're trying to cut down on the white stuff, chef and food blogger Olivia Wollenberg's new book is the answer. 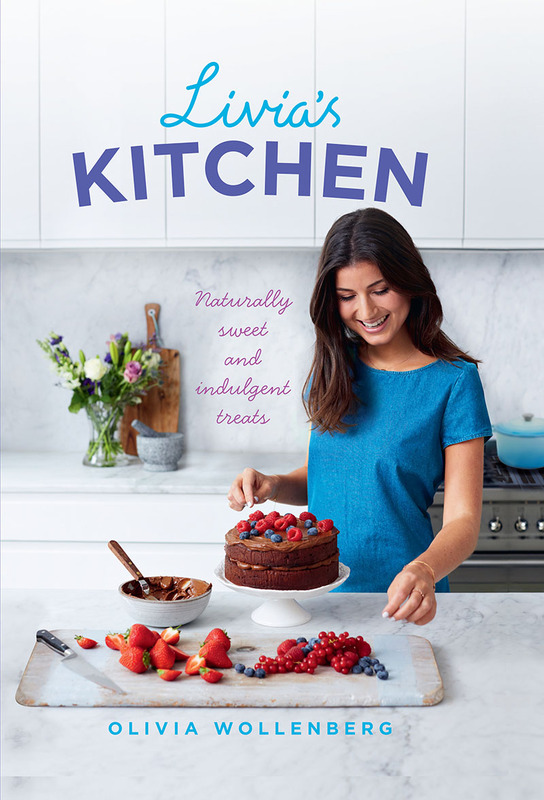 Livia's Kitchen: Naturally Sweet and Indulgent Treats (Ebury Press, £20) uses natural sweeteners like dates and cacao to create deliciously decadent desserts such as oozy chocolate fondant cake and fruity cheese cake. Winning!